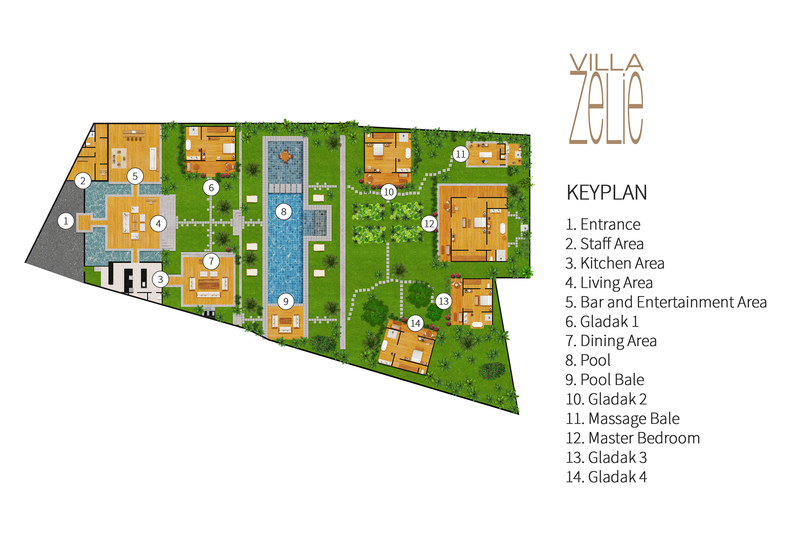 Villa Zelie has a terraced Balinese garden with multiple pavilions offering tropical luxury. Perched at the top of the grounds are side-by-side open-air living and entertainment pavilions and a kitchen. The second terrace is shared by the large dining pavilion and a guestroom. Next is the swimming pool, spanning almost the entire the width of the property and punctuated by the pool house. At the foot of the grounds is the master suite, flanked by three gladak guest suites and a two-storey massage balé tucked away for peace and quiet. Bali is known for barefoot luxury and the level of stylish comfort at Villa Zelie is off the chart ahh-mazing. The living, entertainment and dining pavilions are completely open-sided, so the lush tropical ambiance is welcomed in. All are kept comfortably cool by soaring roofs with traditional Javanese hand-carved beams and ceiling fans. The spacious living pavilion is on an elevated platform that appears to float within a moat of serene Koi ponds. Deeply cushioned couches overlook the sprawling lawns. The adjacent entertainment pavilion features a timber-topped bar, cosy lounge sitting area, movie projector, backgammon table and bookshelves packed with books, board games and fascinating antiques. Meals are enjoyed in the delightful open-sided dining pavilion, framed by fragrant gardenia bushes, giant taro, traveller’s palms and other exotic plants next to a tidy lawn. The room is equipped with Sonos speakers and decorated with a museum-calibre art collection featuring Indonesian tribal pieces, sculptures and ceramic pots. The massive wood table seats up to 14 guests on Javanese benches with hand-carved embellishments and elegant cushions. A modest kitchen at the head of the dining pavilion is equipped with modern appliances. A large island block at the centre is edged by tall stools, where guests can enjoy a snack or chat with the chef. While the swimming pool (which includes a shallow area, ideal for young children, on one side) glimmers in full sun, the pool house beckons with the promise of repose in the shade. It’s the smallest and most casual of the open-air pavilions at Villa Zelie. Driftwood seabirds hang from the pendopo roof. Daybeds face the radiant stone-edged swimming pool and there are baskets full of fresh towels. Inviting indeed. Double sunbeds hem the lengths of the swimming pool; some enjoy dappled sunlight beneath towering frangipani trees whilst others are positioned for maximum sun. They look super-stylish on the lawn, flanked by symmetrical pisang kodok plants and with petrified wood side tables within arm’s reach. The master suite at Villa Zelie has an iconic joglo roof over a wide veranda. But don’t be fooled by its traditional appearance; the luxurious interior is equipped with air-conditioning, modern track lighting and a television. More like a chamber in a Javanese palace than a standard double bedroom, this honeymooner’s heaven has a king bed below a hand-carved tumpang sari timber ceiling. Gorgeous gauzy drapes hang from the outer beams at a generous distance from the bed creating an intimate space for slumber or snuggling while watching a movie. Making things even more romantic, the enormous open-air bathroom has a stone tub, rain shower, matching dressers and twin washbasins. A pair of silk kimonos hang in the walk-in closet. Four individual, king-bedded guest suites are nestled within the gardens, each with charming sitting areas on front verandas facing the pool. All bedrooms have ceiling fans as well as air-conditioning, walk-in closets with full-length mirrors, and large outdoor ensuite bathrooms with tubs and rain showers. They are decorated with unique furniture and eclectic hanging lanterns, each room having its own accent colour – orange, white, Royal blue and French violet.